The Liberal government has proposed legislation that will impact firearms owners in Canada. While the details of the proposed Bill C-71 may yet change, it is important for those currently licenced to own firearms, and those considering obtaining a licence in the near future, to consider the possible changes that may happen should the legislation pass. The popular CZ858 and Swiss Army Classic Green rifles were at first non-restricted rifles in the Canadian market, until an RCMP review re-classified them as prohibited. At that time, many who owned the rifles were concerned that the change would result in a need to give up ownership of their rifles. The government of the day, under former PM Stephen Harper, passed legislation that added an “order-in-council” clause under the “non-restricted” class of firearms, similar to what already exists for restricted and prohibited firearms. This meant the government could pass a regulation designating a firearm as non-restricted, even though the regulatory agency (the RCMP) had determined a firearm fell into another class. This authority is widely used in the other two classifications. For example, AR-15 variant rifles are classed as restricted because of an order-in-council, even though most versions do not fall under any other clause in the restricted category. Bill C-71 proposes to remove the order-in-council clause for non-restricted firearms, and re-class the CZ858 and the Swiss Arms rifles back in the prohibited class. Existing owners of the rifles would be “grandfathered” – in other words, they may keep the rifles, but may only sell, give or loan the rifles to others who have the same grandfathered category on their licence. The legislation gives a deadline of June 30, 2018. If a licence holder does not own one of the affected rifles on that date, they will be unable to own the rifle and cannot be grandfathered. Under the proposed legislation, the mandatory background check during the licencing process will extend to the full lifetime of the applicant, as opposed to the most recent 5 years that is currently the case. The RCMP revokes and denies only a small number of licence applications every year, and this measure will likely not have any significant impact on that figure. Currently, to transfer a firearm, the transferor (i.e. the vendor) is not required to verify the receiver (buyer) has a valid licence, although this is normally the practice with most retailers and in all online sales. This will mainly effect private transfers, for example between two members at a shooting club. Even if the seller has no reason to believe the buyer is unlicenced, for example the club they belong to requires a PAL to join and they have seen the buyer bringing and using other firearms there, the law will now require the seller to verify the PAL status of the buyer. The legislation has not defined what verification involves, but it is believed that the seller would be required to query the buyer’s PAL through the RCMP for each transfer, to ensure it is still valid and has not been revoked or cancelled. 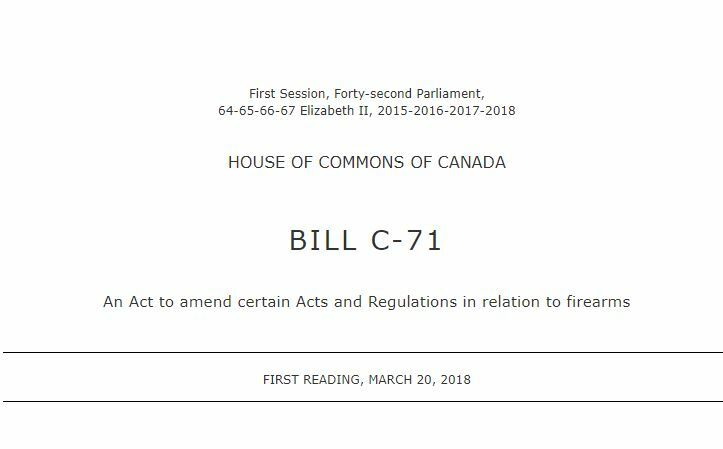 Bill C-71 will have a major impact on the current legislation that requires provincial CFOs to issue an ATT as a “special condition” attached to each restricted PAL holder. Those “automatic ATTs” as they are called, include several routine reasons for transporting a restricted firearm the previous government sought to standardize and automate across Canada. Transporting a restricted firearm to a gunsmith for repair, to/from a border crossing to exit or enter Canada, or to a gun show are among the automatic ATT reasons that would be removed from the special conditions that are now issued. Target shooting would be the sole “automatic” ATT issued, allowing restricted firearms owners to transport their handguns and restricted rifles and shotguns to an approved shooting range for the period their PAL is valid. All other reasons for transporting a restricted-class firearm would require the owner of the firearm to contact their provincial CFO for a short term ATT. There are a handful of other changes proposed in Bill C-71 that will mainly effect government, and not directly impact the end-users, such as information retention, and forfeitures in the event of firearm seizures. The largest and most immediate impact will be to those who are currently looking at getting a firearms licence, and who wished to own the CZ858 or Swiss Arms Classic Green family of rifles. After June 30, 2018, this may not be possible and those who are interested in owning these firearms will need to act quickly to get licenced, and purchase these soon to be prohibited rifles.